CEDAR RAPIDS, Iowa (KCRG-TV9) – Four Oaks is holding a special fundraiser featuring NFL champion Dallas Clark to encourage the community to support its mission. The organization’s mission is to assure children become successful adults through its many preventative programs, emergency shelters, residential centers, and school based programs. 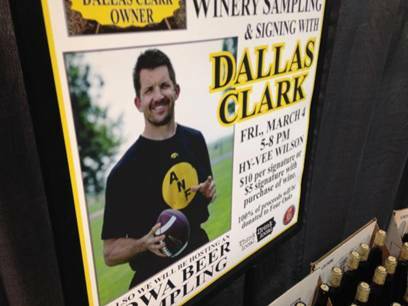 Clark will be signing Hawkeye and Colts memorabilia at the Wilson Avenue HyVee in Cedar Rapids from 5 to 8 p.m. Photos and Autographs are $10, he will also sign Train Wreck Winery bottles for $5. Herky the Hawk will also be on site until 7 p.m.
Before heading to the HyVee fundraiser, Clark is meeting with youth in Four Oak’s residential center. Education and Employment Officer Debbie Craig said the visit will have a big impact on the kids.